Metro South Addiction and Mental Health Services are committed to providing patient-centred care and through our clinical governance framework, RISE, to enabling our staff to provide great care to every person, every day. A wide range of Stage 3 (advanced training) posts are available. Opportunities to learn and develop skills within specialised units. Training in evidence-based psychotherapeutic interventions available - e.g., cognitive remediation therapy, DBT, CBT, ACT and psychotherapy. Dedicated consultant oversight for psychotherapy cases. Numerous STP positions available to expand training experience. Opportunities to develop leadership skills through involvement with clinician-led activities to improve the quality of mental health care provided in our community. To support our people, we are focusing on leadership, clarity and consistency. Learn about our Leadership and Performance Pipeline. 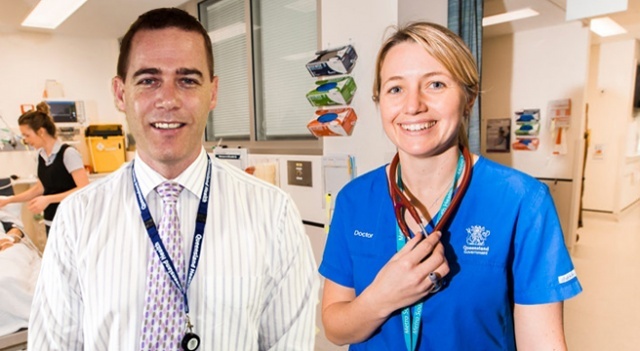 Competency Based Fellowship Programs supported by Accredited Supervisors across the service. Access to Director of Research to support scholarly projects. Strong links with the University of Queensland with a Professorial position at Princess Alexandra Hospital. Research projects of state and national significance being undertaken in collaboration with Griffith University, Queensland University of Technology (QUT) and University of Queensland (UQ). Through the Centre for Neuroscience, Recovery and Mental Health, MSAMHS is a partner within the Brisbane Diamantina Health Partners - Queensland’s first academic health science centre, bringing together the state’s leading hospitals and universities to improve care for patients in our community. Bayside, Logan-Beaudesert and Princess Alexandra Hospital offer a wide range of training opportunities across over 60 available positions. Each campus, due to their location and demographics, offers differing training experiences. Each campus offers rotations in Older Adults Mental Health, Acute Inpatient Services, Resource and Access Services - Acute Care and Emergency Departments, and Community Care Units. Each campus also works closely with Addiction Services and has access to Transcultural Services. Extended inpatient treatment program, which includes acquired brain injury (ABI). Rural outreach services to the island communities of the Moreton Bay with clinics run on Stradbroke Island. Child and Youth Mental Health Service (inpatient, community and infant). Training posts at Belmont Private Hospital - two Registrar positions as a trainee (perinatal services, anxiety and personality disorders). Homeless Health Outreach Team (HHOT). Primary Care Liaison position working in general practice with General Practitioners (GPs). Highest number of registrar positions. Largest Consultation Liaison Psychiatry team in the State with registrar attachments to Mater Mothers Hospital, Princess Alexandra Hospital, QEII Hospital and specialised units, e.g. Renal, Cancer, Spinal. Accredited training posts in Perinatal and Indigenous Mental Health Services. Life Skills Program - Griffith University. The Australian Health Practitioner Regulation Agency (AHPRA) is the organisation responsible for the registration and accreditation of ten health professions across Australia. As a result, there are mandatory registration requirements, which can be viewed online. National Boards will consider every registration application carefully to ensure all practitioners granted registration have the qualifications, skills and experience to provide safe care to the Australian public. To read more information about the registration process, visit AHPRA. For more information about registering to practice across Australia, view AHPRA’s website. The recommended visa for overseas staff employed by Metro South Health is the Temporary Business Long Stay Visa (Sub-Class 457). The 457 Visa is valid for four years and allows the applicant’s spouse or partner to work unlimited hours. It may also be lodged electronically, which decreases processing time and streamlines the character processing from the Department of Immigration and Citizenship. In order to qualify for temporary residency and visas, and to progress to permanent residency in Australia, staff must be eligible to obtain unrestricted registration to practice in Australia. Specific enquires and information must be sourced direct from the Department of Immigration and Citizenship website. Metro South Health is committed to providing a supportive working environment for its medical practitioners to enable them to undertake their duties in a professional manner. Medical indemnity for medical practitioners is covered by the Department of Health under the Indemnity for Queensland Health Medical Practitioners policy. Medical practitioners employed by Metro South Health to perform clinical or other services are indemnified for both claims made against them (as long as duties are undertaken in a professional manner) and appearances before an investigative agency that relate to the performance of such services on behalf of Metro South Health. The scope of indemnity, method of indemnity and exclusions from indemnity for medical practitioners providing services to private patients are set out in the policy. Learn more about services at Metro South Addiction and Mental Health Services. Visit the Metro South Health website or contact the Workforce Services Recruitment Team on 3176 4301 or recruitment_metrosouth@health.qld.gov.au.